When Troop 460 called and said they could use DAC’s expertise in helping with their merit badge we jumped at the chance. Working with today’s youth assures a continued interest in Independent Living for the future. A complicated subject to really cover in a short time, it was decided to break it up over several meetings. At the first meeting Mark Leeper, the Executive Director of DAC, spoke about the services we provide. From helping with information and referrals, to equipment loans, to helping someone learn to advocate for accessibility, he covered it all. 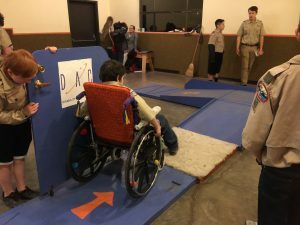 The scouts helped set up a wheelchair obstacle course so the boys could see why the ADA is important. Even something as small as a non-bevelled threshold can make it difficult for someone with mobility issues to access a business. The scouts enjoyed trying their hand at negotiating doorways, carpeting, and uneven surfaces with a manual chair. All 27 boys got a chance to try it out. Other groups used their smart phones to map the church where meetings are held. That way the church could be listed on the BluePath website. It was interesting for them to find out that even as a modern church it still had inaccessible bathrooms. And only the main floor was reachable by someone using a wheelchair. Several other floors of the church were inaccessible due to stairs. Their next meeting will cover Assistive Technology and other topics. Staff person Mellowdee Brooks will be bringing cool technology for the scouts to see demonstrated. Mostly, we helped the boys learn how to effectively interact with others that may have disabilities. Since some disabilities are “invisible” such as autism, a lot relies on the boys being kind. And that is a part of the boy scout motto!